An English Homestead: What Equipment Do You Duplicate? What Equipment Do You Duplicate? I'm building some doors for the extension this week. It's a fairly enjoyable job and good to make something nice for us for a change, I'll do a post on the doors once they're all made and hung. I'm just making a batch of six 4 panel 1950's style doors at the moment and maybe some more when I start work on the downstairs. 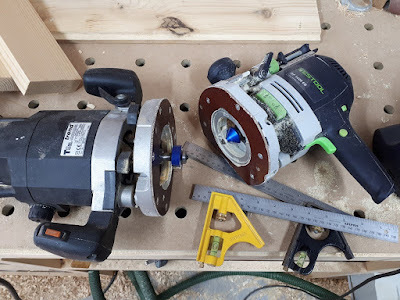 But one of the reasons it enjoyable is that I have the right kit for the job, I've been doing this sort of thing for 15 years now and have a fair selection of tools. I also have some duplicates of some important things as well and this can come in real handy. Like in the picture above, two big routers set up with the bits I need to make a door. Otherwise I'd have to change bits and reset each one for each door! This way is much quicker and not so frustrating! This got me thinking. Now I know the rule of prepping "three is two, two is one, one is none". What do you have multiples of that make your life easier? for example I have three wheelbarrows here, one is never enough! What do you have to keep a spare just so you could carry on with your day to day life with? What do you keep a spare of for emergencies? In my little garden watering cans, I have 3, 2 I keep in the greenhouse full with water. YEs, I have lots as well, Although I have plastic ones and they don't last long. Need to upgrade to something that will last a bit longer! We have lots and lots of buckets for weeding and water... A spare tractor battery is another necessity and also fence posts. Livestock seem to like to break out on a Sunday when the farm centre is shut. You can never have enough sheds either. Tractor batteries are terrible these days. When one was no good ti used to go on the electric fence, now they just dies and they're gone! 7 sewing machines, one is a treadle! Three are old, i.e. over 60 years, the treadle is 100 years old. When I go to retreat about an hour and a half away, I take two or three with me. I've only needed to use a spare once, but I have loaned a machine to someone else. There was one woman who I did not load a machine to - she brought a brand new machine that she had never used and proceeded to abuse it. Nothing worse than lending tools. I'm quite strict and there's only a few peopel who can borrow anything from me in from my carpentry tools. Scissors, lots of them because once I start a job I put them down and can't find them. I'm the same with stanley knives! I agree with Frugal in Essex. Scissors for me. Inside for sewing and utility purposes and outside there are several heavy duty pairs for yard work. I don't own many pairs and we're always hunting them out. My girls pend hows cutting up bits fo paper! Stanley knives or similar: one in the feed shed for opening feed sacks; in the barn to cut baler twine from hay bales; one set aside when bleeding despatched poultry; in the workshop for what they are designed for. I'm with you on that one. I have about 7 on last count and I'm still thinking about buying another box full!
" What do you have to keep a spare just so you could carry on with your day to day life with?" Lipstick. I don't leave home without 2 for any reason, period. Having the right tools for the job indeed! Not for me I'm afraid! Doesn't go with my beard! I was thinking lipstick and was shocked to see someone mention it...lol. I keep several pair of sewing scissors only used for thread or cloth. I buy old screwdrivers and have all sorts. I keep several paintbrushes and keep one no one else is allowed to touch. Great minds think alike I guess! I have lots fo tool no one else is allowed to use. My butchery knives are one thing only I can use! The nearest I have is secateurs, I've got better at keeping track of them since I got an expensive pair! What Would You Do For Water?